MAIN STONE : Blue Kyanite Rough. MATERIAL : Gemstone. Elegant Jewellery. MAIN STONE SHAPE : As Seen In Picture. MAIN STONE COLOR : Multi-Color. MAIN STONE CREATION : Natural. OCCASION : Party. Q : Is the stone Natural or Lab - Created ?. 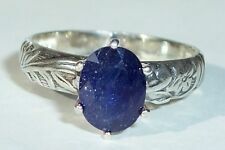 Gorgeous Royal Blue very included Kyanite, color rivals sapphire, approx. 8x6mm oval shaped stone with good polish. I set in a sterling silver Deco setting Size 6.5. Sterling Silver setting made by Artisans in Texas using only US made 925 Sterling Silver. Rolled Gold wears, looks and behaves like 14kt gold. 7 THINGS TO KNOW ABOUT 14KT ROLLED GOLD. Gold fill jewelry is also referred to as "Rolled Gold" jewelry. It is made by heat along with pressure bonding solid 14Kt Gold to a base core. Primary Stone : Genuine Kyanite. Exclusive handcrafted sterling silver jewelry personally selected by us and handcrafted by our very talented artisan team. Stamped (Marked): 925. Style : Pendant. Massive inventory with widest selection available. THIS IS A NATURAL KYANITE GEMSTONE IN A HANDCRAFTED 14KT ROLLED GOLD ONE OF A KIND PENDANT SETTING. Rolled Gold wears, looks and behaves like 14kt gold. 7 THINGS TO KNOW ABOUT 14KT ROLLED GOLD. Gold fill jewelry is also referred to as "Rolled Gold" jewelry. Kyanite is an interesting gem that was discovered during the nineteenth century. The most highly prized kyanite is the vibrant blue or blue-green hue. It is also found in shades of gray, yellow, white and a colorless variety that is considered quite rare. Silvery Blue Kyanite Earrings. Richly colored 10x10mm diamond shaped Blue Kyanite Stones dangle in twisted. Ear wire earrings have ear nuts included. · This minimalist Necklace features a kyanite gemstone with amazing flash! The stone is wrapped with 925 Sterling Silver wire. · Grade A Kyanite gemstone / Super High Quality; not to be compared with the cheap knockoff quality sold from China. THIS IS A NATURAL KYANITE GEMSTONE PENDANT IN A HANDCRAFTED 14KT ROLLED GOLD ONE OF A KIND SETTING. Rolled Gold wears, looks and behaves like 14kt gold. 7 THINGS TO KNOW ABOUT 14KT ROLLED GOLD. Gold fill jewelry is also referred to as "Rolled Gold" jewelry. SOLID 925 SILVER FACETED HIGH QUALITY NATURAL KYANITE GEMSTONE STUD EARRING 0.2"
All of my stones are genuine unless otherwise noted. I design make all of my jewelry line. 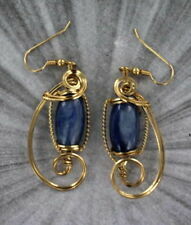 Beautiful Earrings of Genuine Blue Kyanite. Made in all Sterling Silver. 8mm and 6mm coin shaped blue kyanite beads. Blue Kyanite Gemstone. Blue Kyanite has a very strong vibration that creates very rapid transfers of energy. It can also create pathways of energy. Sterling silver findings, french wire and lobster claw clasp. Main Stone : Kyanite. Ring Size : Adjustable. All our jewelry is 100% natural conflict free. Main Stone : Kyanite. All our jewelry is 100% natural conflict free. Ring Size : 8. 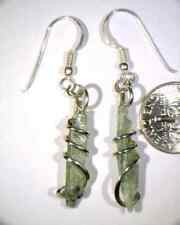 Green Kyanite, White Topaz, Cambodian Zircon Platinum Over Sterling Silver Dangle Earrings TGW 2.98 cts. Laced with Cambodian zircon and white topaz, these jewelry pieces feature oval-cut kyanite gemstones with refreshing sparkles. NEW 415ct NATURAL KYANITE RUBY. KYANITE RUBY NECKLACE, 925 SILVER. 925 STERLING SILVER STAMPED BRACELET. Length necklace : ADJUSTABLE. UNIT OF ITEM (S). MULTI SHAPE DIAMOND CUT. WEIGHT (CT.). (total weight of GP stone) approx. 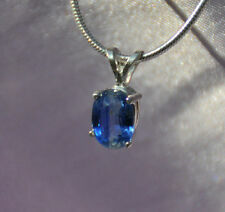 Gorgeous Royal Blue very included Kyanite, color rivals sapphire, approx. 8x6mm oval shaped stone with good polish. I set in a sterling silver braided setting Size 6.5. Sterling Silver setting hand made by Artisans in Texas using only US made 925 Sterling Silver. 5.50 ct BEAUTIFUL! NATURAL AAAAA..KYANITE RING 925 STERLING SILVER.SIZE 6.75. Shape: Natural AAAAA. Kyanite with beautiful natural inclusions 13.50 mm x 10.0 mm = 5.50 ct. Exact Carat Total Weight: ( Silver Stone) 16.70 ct, 3.34 gram. Ring Size; 6.75. Face Ring : 13.5 mm x 18.50 mm. Kyanite Gemstone Holy Cross Pendant 925 sterling Silver Jewelry 2"
Austrian Kyanite, Blue Sapphire Vintage Silver Handmade Jewelry Pendant 1.77"
Orange Kyanite Rough .925 Silver Pendant 2.6"
WE WILL DO OUR BEST TO RESOLVE YOUR PROBLEM AND ISSUE. We assure you that we will resolve any kind of issue or concern you may leave. 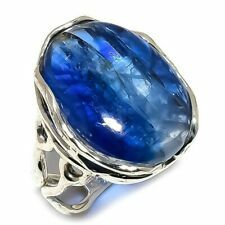 100% Natural Untreated Blue Kyanite Gemstone 925 silver Ring. Ring Size: US size 6. Stone Type: Natural and Genuine. We deal in Natural Earth Mined Gems Only. We can provide Independent Lab Certification Option for all of our products at Extra cost. New ListingAustrian Kyanite Vintage 925 sterling silver Handmade Jewelry Earring 1.50"
Main Stone : Kyanite. All our jewelry is 100% natural conflict free. Occasion : Special Occasion.